Alexander Payne’s last film, About Schmidt, followed the cross-country trek of a man whose forced retirement and sudden widowing prompted a (much) later than usual midlife crisis. Having been effectively numbed by the cocoon that was his day-to-day life, the prospects of a life outside the limitations of the one he had known caught him off guard, and forced him to undergo a re-evaluation of his own existence. That personal reflection was metaphorically represented in more than a literal sense, by his dispensing with old burdens and hopping in his brand-new RV for a drive across the nation. Sideways, Payne’s new film, takes Rex Pickett’s similarly themed novel and spins it into a sympathetic, eminently human story that considers the natural shortcomings of the male psyche without making easy fun of it. About Schmidt is Sideways‘ thematic brethren through obvious association, but the emotional path that the central character, Miles (Paul Giamatti) follows here is quite reminiscent of the path that Michael Douglas’s sad-sack professor took in Curtis Hanson’s Wonder Boys from a few years back. Rather than a gray, chilly, damp Eastern college town, though, Miles tries to come to grips with his demons under the bright, warm sunshine of Northern California’s wine country, where the Vitamin D and good vibes are supposed to flow freely. Supposed to. We first meet Miles following an off-screen knock on the door, his home a typically drab bachelor apartment that just screams “Frustrated Middle-Age Wannabe Author/Middle School English teacher lives here!” Vivid descriptors like “rumpled” and “bedraggled” seem like they were created to describe people like Miles, whom we discover is a divorcee with an overly intuitive knack for critiquing wines. His wine of choice is the Pinot, a wine created from an ornery, sensitive grape that bears more than a stylistic resemblance to its primary connoisseur. Miles’ gift for fiction goes well beyond the page; in reality, his diaries would make a much better seller than the 700-plus page opus he’s trying to get published. His natural inclination is not to deceive, but his vices afford him little opportunity to ever tell the truth. As a wedding gift to his soon-to-be married college buddy Jack (Thomas Haden Church), Miles offers to take him on a week-long tour of Northern California that would feature nothing but good food, golf and wine, a veritable utopia as far as Miles is concerned. Jack is the Oscar to Miles’ Felix, a preternaturally handsome, strapping fellow whose happy-go-lucky exterior belies the fact that his once-flourishing acting career has been reduced to reasonably paying but artistically void commercial voiceovers. To Jack, the trip is prime opportunity to live the carefree bachelor life once last time, which interprets in his mind to being one last opportunity to get laid by someone other than the woman he’s marrying. He intends a similar purpose for Miles, but Miles recoils at the prospects of the trip’s esoteric value being reduced to a mere chick-chasing romp. As the trip plods on, Miles futilely attempts to rein Jack in, especially after Jack comes across a fetching wine-pourer/single mother, Stephanie (Payne’s wife, Sandra Oh) as a vehicle for his own carnal agenda. In his attempt to appease his trip mate by humbly-if briefly-weathering his own plans, Jack marshals a connection between a reticent Miles and Maya (the long-time-gone Virginia Madsen), a server acquaintance of Miles at an establishment he has frequented on previous trips. To humor Jack, more out of frustration than anything else, Miles agrees to never mention that Jack is getting married, and that their vacation is actually an extended bachelor party. In their one-on-one moments, Miles appears hesitant with Maya not because of the physical contact being dangled, but of the notion that his true motivation for taking Jack on this wine-sampling journey might be derailed for good. Where About Schmidt was often morose and slow-footed, Sideways is consistently laugh out loud funny, bathing itself in the paradoxical possibilities presented by its oddly-matched protagonists. They both have huge, gaping flaws; Miles has been clinically depressed since his divorce, which has sent him down a path of veiled alcoholism and situational duplicity, and Jack is a terminal womanizer, a big-hearted lout whose mental astigmatism always short-circuits his better intentions. Payne volleys seamlessly between borderline slapstick and very tender, intimate moments, interjecting moments of equally funny or appropriate dialogue to make the most of their impact (“You didn’t drink and dial, did you?!”). Giamatti and Church are well-matched as the lovelorn schlub and the fading former heartthrob, and while Church has some brutally funny moments himself, Giamatti is the core of the film. He reels Miles in or sets him off at the drop of a hat, punctuated by heartbreaking moments such as when he finally blows a gasket in a winery, or when he comes face to face with his remarried ex-wife for the first time since their divorce. If those scenes don’t bury you, the speechless moments with Miles in the diner will soon after. By the time you reach those heart-wrenching final moments in the film’s coda, you almost feel guilty for having laughed yourself silly through most of the entire movie. Therein, though, lies the beauty of Sideways. It operates with traditional cinematic platitudes, but wraps them in a crisp, well-written, well-executed story that is driven forward by its compelling stars and some very smart, astute direction. It’s not escapist entertainment by any means, in fact, it might hit a little too close to home for some guys who realize that they’re already a little too familiar with one or either of the lead characters. We’ve seen these guys before, in different places with different names. It’s a film about ordinary people trying to live through their mistakes, but don’t dread the premise. 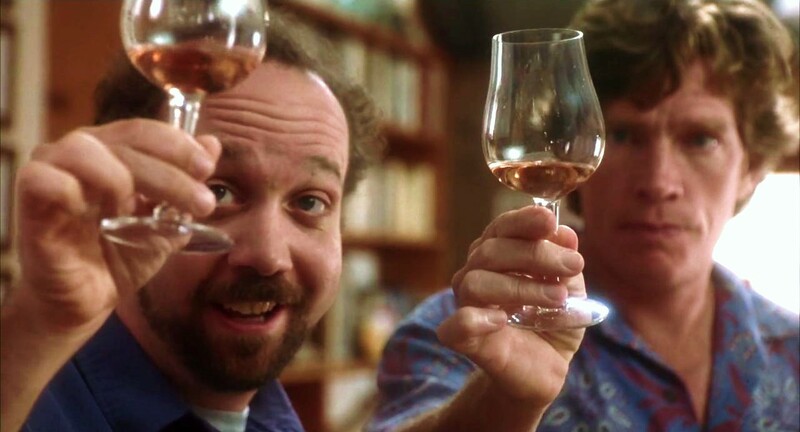 Sideways is an extraordinary film about ordinary people. It does have a couple of minor flaws, but then again, so do Miles and Jack.